The sign is partially obstructed but I thought it odd to have a display of pumpkins when all of the signs were advertising North Carolina apples. I didn't see any apples at all. 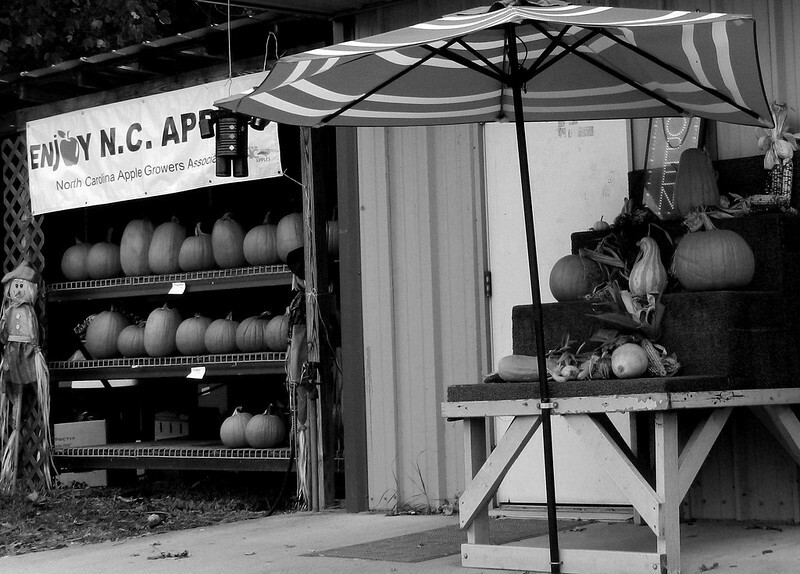 I love oddities like that Carver...and the pumpkins look great in black and white which is a bit eerie. Er... pumpkin-apples? Apple-pumpkins? Excellent photo though. The might have cleared the apple until after Halloween and then they will pack them back on display? Fine non sequitur with sign and lack of apples. Perhaps they had apples in back? Happy Halloween. I do like your pumpkins. I'm sure the apples will be back tomorrow. I always wonder what happens to all the pumpkins on November 1. Great photo! Looks so good in b&w! Great photo for pumpkin time. The pumpkin season rules it seems. And the pumpkins remind me of eerie faery houses waiting for owners. Interesting photo. Great shot for this weekend, Carver... but where are the apples.... hmmm!? Hmm, orange apples?! Great shot! A sign for the season. Wonderful photo in B&W! Love the scene!